AHH! Those southern Indiana tree tunneled roads. On Friday, September 26th, I had a fun and full day in my childhood hometown, Evansville, Indiana. It started out at Highland Elementary School with three back to back presentations. Here are a couple of shots during the presentation where I talk about how I became an author/illustrator and teach about the process of writing and illustrating books. I get through the presentation in about 20-25 minutes and then spend another 20-25 having the kids help create a character with me. At the end I leave this character with the school along with a challenge to the kids. Here is a short clip of one of my presentations. One of the best things about the morning was connecting up with my former 1st grade teacher, Teri Chamberlain. And old friends who now have children at the school. And many who didn't have children there who just heard I was coming and took time to come to the school and see me speak. Right after I was finished with my presentations at Highland and signing books there, I hurried across town to Westside Catholic School where I did another presentation for grades K-5. After a lovely dinner with a childhood friend and her family, I went over to the Evansville Barnes and Noble store for a book signing. I saw met many new people and saw many old friends there as well. It was a lovely evening. One amazingly awesome thing that happened at Barnes and Noble that night was meeting this beautiful and talented lady, Kristi Valiant. 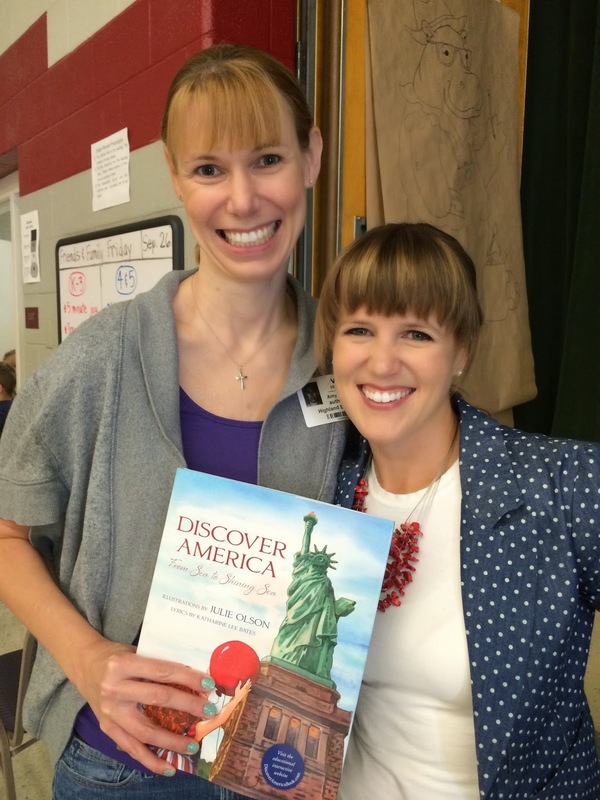 She is a fellow author/illustrator who heard about my visit from a mutual friend. This friend told her to come meet me and she graciously did. That little chat at Barnes and Noble wasn't nearly enough so we had to meet up the following day to talk shop. Check out Kristi's work HERE. Over the weekend I attended my 20th High School reunion and then headed to Indianapolis. On Monday morning I did three more presentations at Stonegate Elementary School. It was a beautiful school and fun to present to those kids. In my presentations, I talk about the source of ideas and how the idea for a book is the most important step and sometimes comes when you aren't even trying. Then comes the rest of the hard work...a lovely adventure. I left that evening to fly back to Utah. I had such a great time sharing my love of writing, illustrating and CREATING, with those kids. I love to see their excitement and creative energy ready to burst when I'm done. I only want to inspire people to do something they love and to love what they do. I'd love to come visit your child's school. Contact me via email at jujubeeillustrations (at) gmail. Or click on the School Visit link above. Will you illustrate my book? "WILL YOU ILLUSTRATE MY BOOK?" The short and truthful answer is usually, "I'm sorry. I can't." But you probably want the long answer. So here it is (condensed to basics). There are a couple of options if you have a picture book you want published. You can go the traditional route or the self publishing route (and I'll add a third option too...non-traditional). Here is an explanation of what those options entail and why I end up saying, I can't. 1. TRADITIONAL ROUTE: Publishers choose the illustrator. The author has no say. The publisher is the one footing the bill, who’s experienced in the industry, and who organizes the whole shebang. They know what sells and who is professional enough to illustrate a book. A book is a collaboration. Your part is the manuscript. And then you give up control over the rest. The illustrator makes it even better by adding subplot and nuances you’d never imagine through the pictures alone. Then the publisher’s graphic designer chooses the appropriate font, places the type and lays out the whole book for the printer. The marketing team develops a plan and begins selling your book to buyers before it’s even printed and getting it on the book buyers lists (retail shelves). They give the author and the illustrator an advance against the future royalties and then when the book starts selling (a year or two after acceptance by publisher), you start earning a 5% royalty on the retail price of the book. Once the $0.75 of each book sold adds up to equal what the publisher gave you initially, you start seeing a paycheck from the publisher. That’s called earning out your advance. If your book never sells enough to make you money above the advance, you don’t have to give any of that advance back to the publisher. That’s the risk they take…putting up all the money. They also only make a small profit on the book themselves (if any at all). Their take home after all the expenses of marketing, printing, overhead etc. is only about 10% of the retail price of a book. "Who makes all the money?" you ask. The book resale companies. Amazon, Barnes & Noble, Walmart, etc. They mark up a picture book by about 50%. They get all that markup (minus their shipping, overhead etc.) But even after all this is said, the traditional route is usually by far the most lucrative way to publish a book. 2. SELF PUBLISHING ROUTE: You choose the illustrator and negotiate terms. Terms of payment, royalties, contracts etc. It's a big headache and you can get into a lot of legal trouble down the line if you or they don't know how to legally work all that out up front. You also have to oversee all print press readiness, (file format, pre-press layout, etc. ), find a printer, and attempt to hire a distributor. Unfortunately, there are VERY FEW reputable distributors if any who take on self-published works. If you don’t have a distributor, you cannot get into bookstores and onto shelves. You may be able to do a signing at a Costco or get it in some boutiques, but not into actual bookstores or even large chain stores like Walmart and ToysRus (which actually sell a lot of children's books). But if you want to sell books out of your garage, hand peddle them to boutiques, set up an online store for them…by all means…self publish. It’s a grueling and difficult task to do it all but some people make it work. And there are even a few success stories. But personally, it’s far too risky and too much work with little return on the investment for me to go that route personally. And overall, the sales of a book really really depend on marketing. If you already have a huge following of people in a certain community (5K plus) who would definitely buy your book, then maybe you could make this route work. I'm personally not that popular so...My answer is still, "I can't" self-publish. 3. NON-TRADITIONAL ROUTE: This includes EBOOKS, KICKSTARTER, APPS. You could make your book into an ebook and sell it online via Amazon Kindle, the Nook store, as a downloadable PDF file on your own site or various others. Doing this gets rid of any printing costs and shipping costs and a lot of distribution problems. However there are issues with ebooks too. - You have to get your book formatted correctly for a WIDE range of devices which is really really difficult. So you have to pay a tech head to do it or try an learn yourself. -You may have to pay a fee or a commission to have your book on sites like Amazon, Barnes&Noble, or iBooks. - You are not given preferential billing as a self-published person on the ebook sites. Usually publishers get their books to the top or their are special sections dividing the two "classes" of books, self-published vs publisher. - You still have to market the heck out of a book to get it to sell. -I've tried this route. It didn't work for me. But the costs are low out of pocket. But high time and expertise. KICKSTARTER: is another avenue of publishing that's close to the idea of print on demand. Check out books on their site and you'll see what I'm talking about. Sometimes it works, sometimes it doesn't. If you have a big following already in the social media world, it may work. Or if you are producing something for a niche market. It worked WONDERFULLY for my friend, but it was really hard work. So much packing and shipping and printing to figure out. APPS: These are definitely not the way to do a book. Too many apps out there and books are not games. If you want to make a game, go ahead. But I'm not an app illustrator. So I don't do these. So much technology goes into creating and the marketing of them is completely hit and miss. SO OVERALL in the non-traditional route, I say "I can't." I've learned it takes too much time doing what I don't want to be doing to go this route. Also, if you are serious about writing children’s books beyond just this one, I highly suggest joining the Society of Children’s Book Writers and Illustrators. I learned sooooo much from them and also was given lists of publishers to submit my work to. http://www.SCWBI.org Check them out. For those of you who are interested, my church holds a conference for the entire world two times a year and many people have asked for a copy of my illustrated notes. I call them #sketchnotes . Here's a link to the PDF file of all the notes from October's conference sessions. These are for personal use and not for resale of any kind. Enjoy!